The process of gluconeogenesis starts from various possible precursors - plausible entry points like, Pyruvate, OAA, Fumarate, Propionate (as succinate) and alpha-KG. It is important to note that, acetyl-coA is not an entry point for Gluconeogenesis. Entry points shown as blue circles. The most common reason cited for this is the irreversibility of the enzyme, pyruvate dehydrogenase. Since it is irreversible, Acetyl coA can't get back to pyruvate to go on forming glucose. But, Acetyl CoA naturally enters the Krebs cycle, so why can't it go ahead and form glucose via gluconeogenesis using one of the Krebs intermediates? I have had this doubt for very long and tried to come up with an explanation to satisfy myself but I still don't know if it is valid. So here it goes. 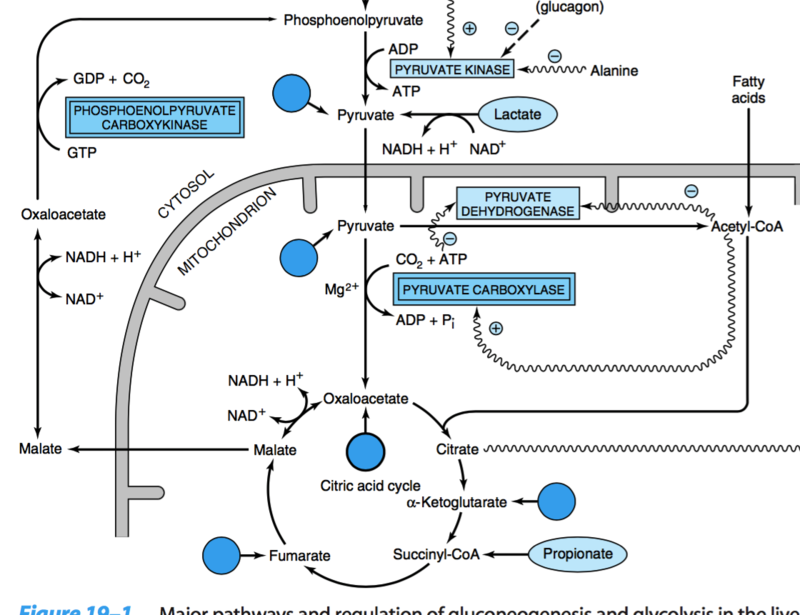 All the entry points to gluconeogenesis (mentioned before) are an addition to the Krebs cycle. They get on the boat, sail along, get off at oxaloacetate and leave. They don't bother the boat in any other way. Even Pyruvate, forms oxaloacetate via pyruvate carboxylase and then gets on the boat for gluconeogenesis. Is this explanation right? Are there any other ways to explain why irreversibility of PDH results in this? Although acetyl-coA can enter gluconeogenesis via pathways like glyoxylate cycle (not in humans) and pathways to make pyruvate from acetone (not economical) to form glucose, the question is why it can not do so directly via the Krebs cycle. Image: Harper's Biochemistry, 29th Edition. The problem is that acetyl-CoA enters the TCA cycle by condensing with oxaloacetate in the citrate synthase reaction. Therefore, you need 1 oxaloacetate for each acetyl-CoA added. Now, if the citrate formed goes on to oxaloacetate which is then removed for gluconeogenesis, there is no oxalocatete left for the next citrate synthase reaction. The reactions do not balance. Therefore, an anaplerotic substrate like glutamine or asparate is needed to replenish the lost oxaloacetate. Can cats use ketone bodies as only source of energy? Why are there only 6 molecules of water produced in the synthesis of the fatty acid, palmitate? Why are both glucagon and cortisol released in hypoglycemia? Why can't pyruvate be used directly in the Krebs cycle? How is Saccharomyces cerevisiae grown on acetate and ammonium able to produce TCA intermediates?